We worked on our last color this past week; wonderful white. 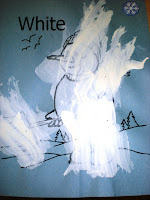 I forgot my camera on Tuesday so I don't have pictures of the children painting the first picture for the color book, which was.....a snowman--of course. Snow seems to be the center of our discussions for the color white. We even got some snow yesterday--right on time! 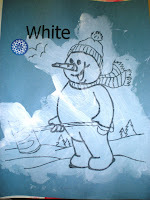 Our first page was our snowman. 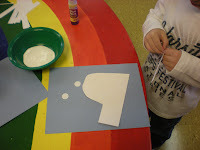 We painted it using cotton balls. I think they had more fun with those soft cotton balls. Our next page was an igloo. 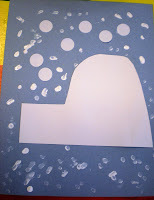 I had cut out some igloo shapes which the children glued to the paper. 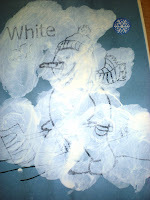 I then had some white circle stickers and some paint with Q-Tips which the children could use to make snowflakes. I let them decide if they wanted to use stickers, paint, or both. 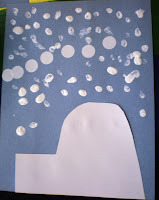 The majority of the children wanted to do both types of snowflakes. 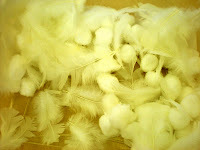 Our sensory tub contained a mixture of cotton balls, white feathers, and cut up pieces of white straws. 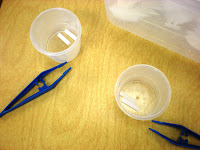 I had the children use tweezers to take out the white straw pieces and put them in a cup. They really did well with this. They also really enjoyed playing in this tub. I plan to put lots of different colored straw pieces in it this week to let them play in it. The color books go home this week. The children are so excited. They can't wait to show their families all the fun pages they made. Loved the snow man and the igloo! Fun ideas! I love the cottonball paintings. I have a big bag of cotton balls in my storage room. Now I have a plan! I like to include scissors in my straw sensory table. They're great for working on scissor skills and when you cut them just right the small bits take off like rockets. I had one boy get so good at it he could tell you who he was going to hit with his cut straw and do it almost every time! I also include some string so they can make necklaces from the cut straws, but that isn't nearly as popular. Neat ideas for your sensory tub! 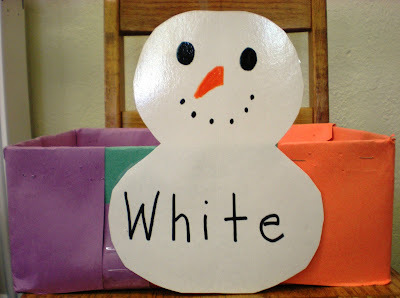 I miss preschool activities with my big girls, but am looking forward to having toddler/preschool fun with my new baby! Hope you are doing well. I'm still hanging in there! 2 1/2 more weeks until the big due date! Awesome site! Love to look at kid art that was ACTUALLY done by kids!